Police confirmed on Tuesday morning that all four suspects wanted in connection with the killing of a police officer in Perry Hall on Monday afternoon are now in custody. Authorities say that all four suspects are teenagers and were wanted in connection with several recent burglaries in the area. The suspect who was arrested on Monday has been identified as 16-year-0ld Dawnta Anthony Harris, of the 1600 block of Vincent Court, 21217. The other suspects have not yet been identified. Harris has been charged as an adult with first-degree murder. 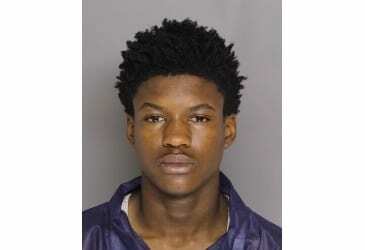 He is being held at the Baltimore County Department of Corrections and is expected to appear for a bail review on Tuesday afternoon. Officer Amy Caprio was killed in the line of duty shortly after 2 p.m. on Monday while investigating a suspicious vehicle on Linwen Way in Perry Hall. Initial reports indicated that Officer Caprio had been shot but police have not yet confirmed this. Witness accounts indicate that Officer Caprio may have been run over. Officers will be in area today to canvas for property stolen during the burglaries.